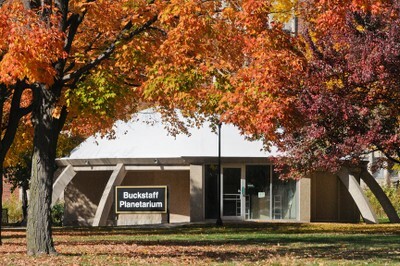 *** Planetarium renovation is on hold indefinitely. Please visit the Barlow Planetarium in Menasha in the meantime. Show information can be found at uwfox.uwc.edu/barlow. Earth in the Solar System Four years through adult You will see a basic overview of the significant structures of our solar system. Included are images of the planets in our solar system with a focus on their differences and similarities, and on the movement of the planets around the Sun. *This show was written to address the WI science standards. Starry Nights Four years throughadult You will see a seasonal overview of constellations and stars. We will share some of the cultural mythology that is associated with them and the circumpolar (year-round) constellations. Learn about the role and importance of Polaris (North Star). The Big Dipper Four years through adult This show concentrates on the most recognizable asterism in the northern hemisphere. The Big Dipper can be used to find many constellations in the night sky in an easy to remember format. Also included is some of the mythology and importance of this constellation from many different cultures. What Is In the Sky? Three year through nine years Kids are invited to look up and ask, “What is in the sky?” We will start with clouds and other things we can see during the day and at night. Then we will discuss how telescopes can help us see the sky better and introduce the planets and stars. The Signs of the Zodiac Nine year through adult Learn the history and stories behind all the signs of the Zodiac. You will learn when and where to find the different constellations in the sky. Native American Star Stories Four years through adult The focus of this show is on some of the star stories that have been passed down through the generations by different Native American cultures. A Deeper Look at the Night Sky Eight years through adult This show will examine the constellations that can be seen on the night of the show and highlights the brightest stars. Then we will take a deeper look into these constellations to find any anomalies (nebulae, galaxies, etc.) that are located in that part of the sky. Nine years through adult “Explorers of Mauna Kea” was developed by the Bishop Museum and NASA. Mauna Kea is a mountain in Hawaii with dozens of telescopes. The show talks about how the mountain was created, some of its early history and some of the astronomy that is being done there currently. Monsters in the Sky Nine years through adult Hear stories from many different cultures about some of the scary monsters that can be found in our night sky as constellations. Christmas Nights Nine years through adult What is the Christmas star? How did the sky appear to the Magi (i.e., astrologers) in years two and three B.C.? What was the sky like on the night that Christians celebrate as the birth of Jesus? Learn the answers to these questions and more! Love is in the Sky Nine years through adult Enjoy a love-guided tour of the evening sky. Learn about the timeless love stories that include Vega, Altair and the Corona Borealis to name a few! Anomalies of the Universe Nine years through adult Come learn about solar nebula, comets, meteorites and meteor showers, asteroids and the asteroid belt, Aurora Borealis and the life of a star.